Create your personal island resort with this beautiful jacquard ensemble. Softly flowing palm fronds recall the ease and beauty of island living no matter where you call home. The jacquard woven comforter and shams in a soothing palette of sage green and ivory mix easily with pineapple printed cotton sheeting, elegant embroidered cotton canvas European shams, and embroidered accent pillows as well as a signature 'Relax' printed canvas square. The result is a cool, casual style that will welcome you home. I ordered the King set and was very pleased. The size was perfect for my king bed, not skimpy in the least. The color and texture were exactly as shown. The comforter has substantial weight and is quite warm. I would recommend this set. This is a beautiful comforter. The color is soft and airy. Well made and fits perfectly on our king bed! Very happy with our purchase. 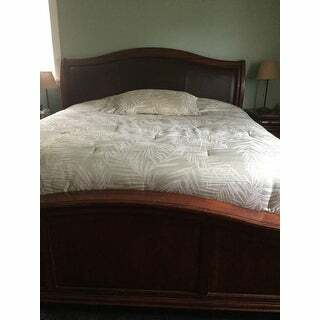 My husband and I love the quality of this comforter and It fits our oversized king bed perfectly! I haven’t opened this up yet......But I’m waiting till we move in our new home......it should be amazing. The look will be perfect for this room as it has a palm tree outside the window! Ok......we opened the new set and are absolutely thrilled on how well it looks. We live on a pond and it is perfect with the room. Nice material it is beautiful and really dresses up the bedroom. It gives the room a nice toned down tropical look. The comforter is not as heavy as I wanted it to be which worries me about how long it will last. I do recommend it for a guest bedroom that won't get used every day. This comforter is just as pictured. The colors were just what I wanted for my spare bedroom. The quality was great, very thick. I may not get guest to leave. Love this comforter. It’s the perfect accent for our guest room tropical/pineapple welcome theme! Love this comforter set! Exactly as advertised. The quilt is beautiful and looks great in our guest room, however I’m not as pleased with the dust ruffle. Really Tommy Bahama, you make a beautiful product, why cheapen it with a cheaper dust ruffle? Nice print, seems to be made with quality. Just washed it, and yes it is a bit lumpy, but know that will work out. Good weight to it, does not feel cheap. It is pretty and polyester. It Pills. "Is this set machine washable. I'm looking for a spread that's light weight. Would it be considered summer weight?" "I want to order the King comforter set. Is the color exactly as pictured? I ordered from a diff site and it was pastel green. (sage)Thank you!"